Tenosynovitis of the foot and ankle is an uncommon condition, and may stem from several causes resulting in foot/ankle pain. Additionally, infectious tenosynovitis resulting from retained foreign bodies distant from the tendon is rarely reported. 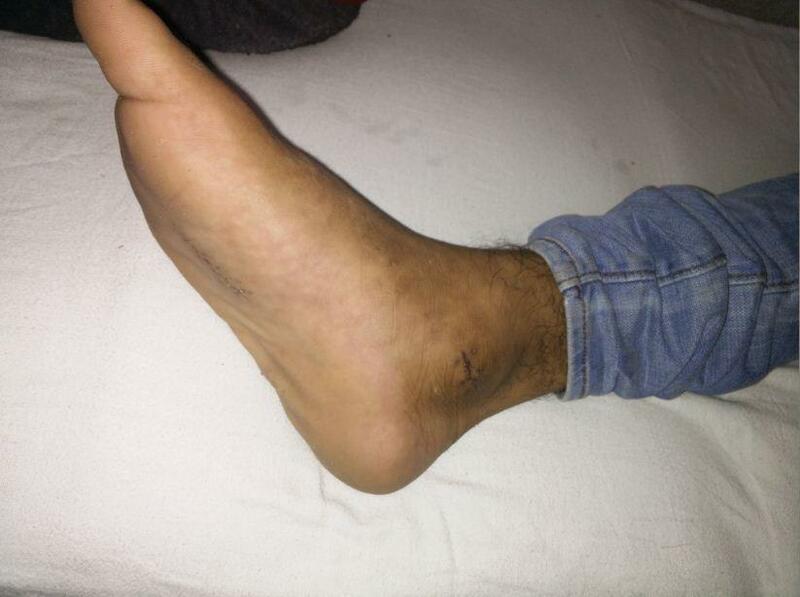 In this paper we report a case of a young male presenting with a short history of swelling and pain of the ankle. Clinical examination suggested tenosynovitis of the flexor digitorum longus tendon. There were no systemic symptoms and blood parameters within normal limits. Non-response to conservative treatment prompted imaging of the foot which revealed a foreign body, which had been lying there for many years and forgotten about by the patient. The patient underwent removal of foreign body and made a complete recovery. Foreign bodies can be difficult to diagnose and should be considered in the differential diagnosis of unexplained pain, even in the absence of recalled trauma. Puncture wounds of the foot through rubber soled sandals or shoes have been described to leave behind pieces of the sole material as foreign bodies. Ultrasonography is particularly helpful in confirming such diagnoses. oot and ankle pain is one of the common complaints with which patients present in an orthopaedic clinic. Non-traumatic foot and ankle pain stems from a wide variety of causes which need to be excluded by detailed history and clinical examination to arrive at a correct diagnosis and institute effective treatment. Tenosynovitis is a relatively uncommon entity causing foot and ankle pain and most cases have a specific etiology for the condition. We present the case of a young patient who had tenosynovitis of the flexor digitorum longus that remained unresponsive to treatment for a long time because the etiology could not be established. 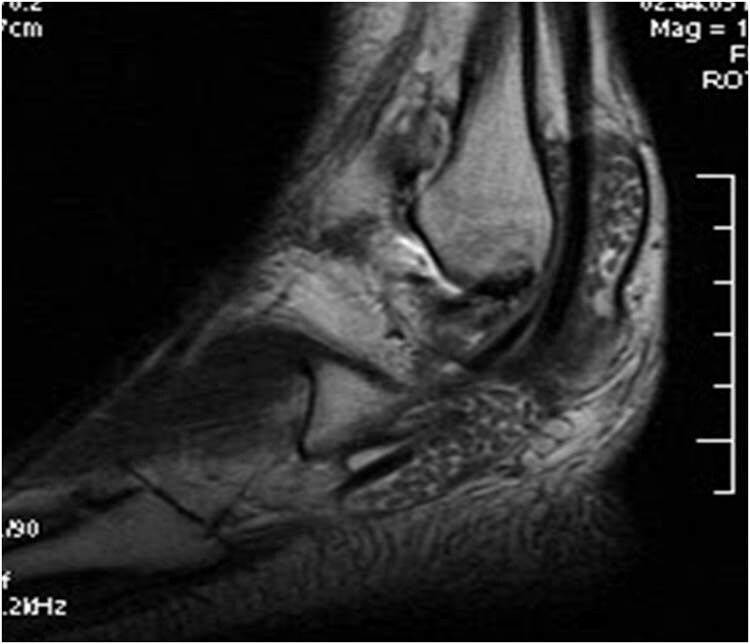 A 20-year-old male presented in the clinic in January 2016 with a history of pain and swelling just proximal to the medial aspect of the right ankle of one month duration. Examination revealed a soft to fluctuant swelling behind the medial malleolus merging imperceptibly with the soft tissue of the calf above and the foot below. The swelling was tender with some mobility in a side to side direction. The pain increased with movement of the toes. There was no history of fever, joint pains or stiffness, trauma to the ankle, or any significant drug history. A clinical diagnosis of tenosynovitis was made and the patient was prescribed anti-inflammatory medication and cold compresses. Blood parameters were ordered at the same time. The total leukocyte count was 8500/mm3. ESR was 12mm and CRP was low positive. Serology for rheumatoid arthritis was negative. Symptomatic treatment and physical therapy was continued but the patient did not improve. Over a period of one month the symptoms worsened. Plain radiographs were normal. An MRI was ordered and a local steroid injection of the tendon sheath was planned. 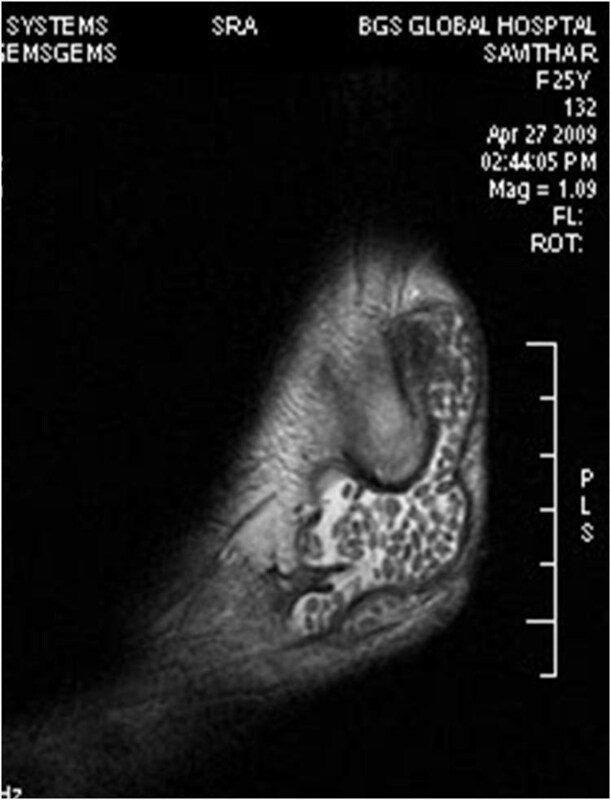 MRI showed tenosynovitis of the flexor digitorum longus (FDL) tendon with collection in the tendon sheath at the ankle. 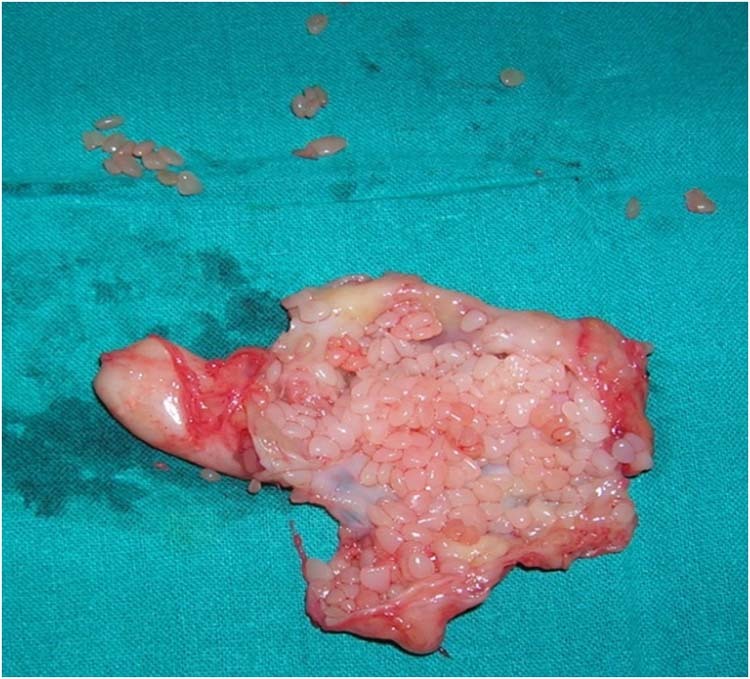 At the time of steroid injection, initial aspiration yielded pus. Injection was abandoned, and the pus was sent for culture and sensitivities. Possible causes of pyogenic tenosynovitis were sought. The patient was asked again about any penetrating injuries in the region. He recalled a penetrating wound in the sole (from a nail) that he had suffered 4 years back, which had healed uneventfully. Present examination of the sole was normal. An ultrasonography of the foot and ankle was ordered. Ultrasound revealed an echogenic foreign body in the midsole at a depth of about 1 cm from the skin surface, and about 3 mm in each dimension (Figure 1). Fluid collection was also found behind the medial malleolus, extending into the subcutaneous tissue. 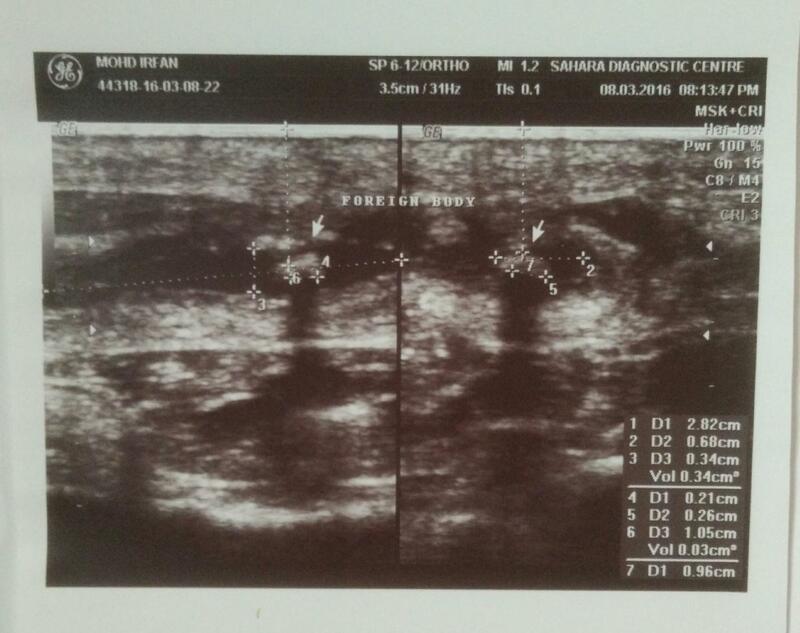 Figure 1 Ultrasonographic image showing the foreign body. Surgery was planned and two incisions were made. The incision in the sole at the site marked by the sonologist revealed a red rubber foreign body, about 3 mm by 2 mm inside a loculus of pus (Figure 2). Another incision made behind the medial malleolus was used to drain the pus in the FDL tendon sheath and the surrounding tissue. The foreign body was a piece from the slipper sole that the nail had pushed inside. At that time, treatment with antibiotics and analgesics had probably resulted in healing of the wound, and the foreign body had become walled off. Now infection had reactivated and pus had travelled up along the sheath of the FDL, presenting as swelling at the ankle. Following incision and drainage, and administration of culture specific antibiotics, the wounds healed uneventfully and the patient had complete resolution of symptoms. He was asymptomatic at the time of last follow up, at eight months after surgery (Figure 3). Figure 2 Note the red piece of rubber found on exploration of the plantar foot. Figure 3 Complete healing of both wounds at eight month follow-up. An Australian study concluded that almost 1 in 5 people in the community suffer from foot and ankle pain of nontraumatic origin . Cases of nontraumatic foot and ankle pain are relatively frequent in our practice as well. Effective treatment of these cases depends on establishment of a diagnosis by accurate history and clinical examination, along with investigations and imaging. Among the common causes of such presentations are tendinitis, tendon rupture, bone spurs, bursitis, flatfeet, infections, rheumatoid arthritis and gout . Our patient was a young and healthy male, with a relatively short duration of symptoms. In the absence of any fever or systemic signs, infection was not high up among our differential diagnoses. We ruled out inflammatory arthritis with clinical findings, serology and blood parameters. Some drugs like fluoroquinolones have been reported to cause tenosynovitis , but our patient had no significant drug history. Foreign bodies can be difficult to diagnose and should be considered in the differential diagnosis of unexplained pain, even in the absence of recalled trauma. If there is no recent history of trauma (skin puncture), and if the foreign body is radiolucent, the diagnosis is often difficult with plain radiographs [5,6]. Such foreign bodies can present later with a myriad of manifestations like local abscess, persistent pain, periostitis, osteomyelitis, bursitis, monoarthritis, synovitis, lytic lesions and even appear as neoplasms [4,6-9]. Even though MRI is very informative about soft tissue conditions of the foot, ultrasonography has now become the investigation of choice in diagnosing and locating retained foreign bodies in the extremities when they are radiolucent [10,11,12]. Harris  reported the misinterpretation of MRI, and final diagnosis with the help of ultrasonography, as in our case. Puncture wounds of the foot through rubber soled sandals or shoes have been described to leave behind pieces of the sole material as foreign bodies [13,14]. A high index of suspicion is required when the patient presents late after the initial injury and does not volunteer information about the puncture wound. This is especially important in a case like ours where the area of presentation (distal leg) was away from the region of the puncture (plantar foot). To conclude, even in the absence of a recent history of penetrating trauma, the possibility of a foreign body must be considered and investigated. 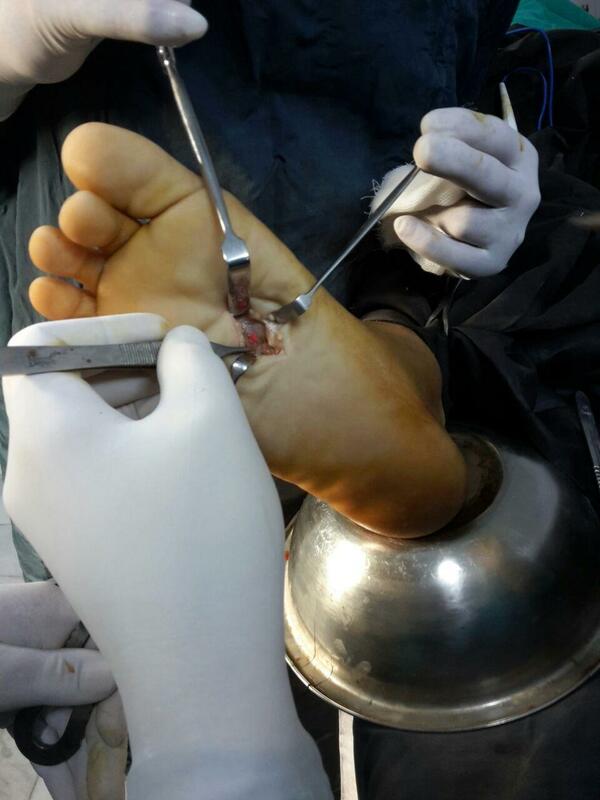 Our case is unique because of the long duration between the injury and the presentation, and also the peculiar presentation of tenosynovitis above the ankle when the offending agent was present in the plantar foot. We further affirm that ultrasonography can be alternate imaging technique after plain radiography for all patients with suspected foreign bodies. Hill CL, Gill TK, Menz HB, Taylor AW. Prevalence and correlates of foot pain in a population-based study: the North West Adelaide health study. J Foot Ankle Res. 2008; 1: 2. Foot pain. Causes. Mayo Clinic Staff. Available at: http://www.mayoclinic.org/symptoms/foot-pain/basics/causes/sym-20050792. Accessed September 16, 2016. Kayabas U, Yetkin F, Firat AK, Ozcan H, Bayindir Y. Ciprofloxacin-induced urticaria and tenosynovitis: a case report. Chemotherapy. 2008;54(4):288-90. Jones MD, Sweet KJ, Hoffer ZS. Retained viable plant material in the calcaneus: a case report of a 22-year-old soldier with atypical heel pain. J Am Podiatr Med Assoc. 2015 Jan-Feb;105(1):92-5. Harris EJ Retained Hawthorn fragment in a child’s foot complicated by infection: diagnosis and excision aided by localization with ultrasound. J Foot Ankle Surg. 2010 Mar-Apr;49(2):161-5. 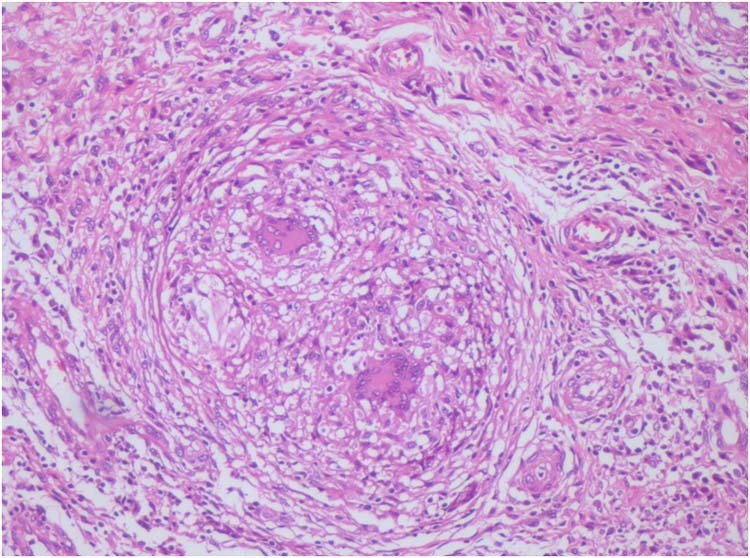 I. El Bouchti, F. Ait Essi, I. Abkari, M. Latifi, and S. El Hassani, “Foreign Body Granuloma: A Diagnosis Not to Forget,” Case Reports in Orthopedics, vol. 2012, Article ID 439836, 2 pages, 2012. Suresh SS. Orthopaedic Manifestations of Date Thorn Injury: Case series. Sultan Qaboos Univ Med J. 2008 Nov;8(3):347-52. Suresh SS. 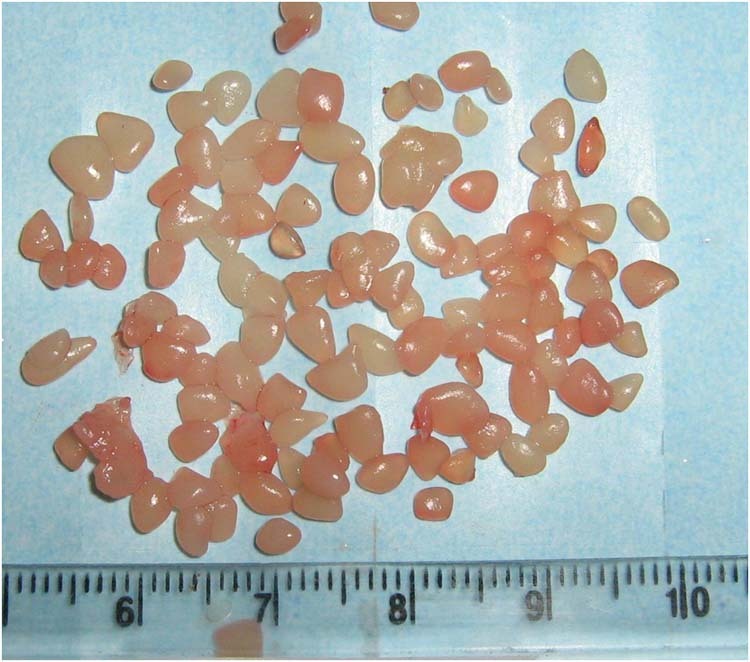 Periostitis of the metatarsal caused by a date palm thorn in a child: a case report. J Foot Ankle Surg. 2011 Mar-Apr;50(2):227-9. Flom LL, Ellis GL. Radiologic evaluation of foreign bodies. Emerg Med Clin North Am. 1992 Feb;10(1):163-77. Soudack M, Nachtigal A, Gaitini D. Clinically unsuspected foreign bodies: the importance of sonography. J Ultrasound Med. 2003 Dec;22(12):1381-5. Chang HC, Verhoeven W, Chay WM. Rubber foreign bodies in puncture wounds of the foot in patients wearing rubber-soled shoes. Foot Ankle Int. 2001 May;22(5):409-14.